I received an email from Chef Jeff today. 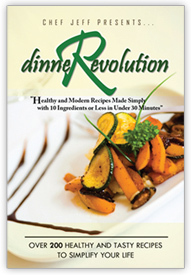 He is doing his free cookbook giveaway again e-cookbook called “DinneRevolution”. The cookbook sells for $27.00, so this is a good deal. The recipes are family friendly, healthy, less than 10 ingredients, and takes 30 minutes or less to prepare / cook. Chef Jeff was nice enough to provide me with a copy of his e-cookbook, which I dearly love. I know you will love it as much as I do. How nice of you to let us know about this! As much as your last post,btw! Delightful. Its a great gift. Thanks Christine,I will down load after writing the comment. That's a nice collection to add to the kitty christine. Oh wow! Thank you so much for sharing this! I love presents. :) I hope you have a good start to your week, Christine! Thank you Christine and sure I will have a look because at times I am also on time crisis to prepare a meal for my family. How great! Thanks for sharing this! Thanks, Christine. Healthy recipes are what I always look for. Thanks for sharing the link. Headed over to check it out now.